Swiss ski resort Lenzerheide is a part of the skiing Parpan, Valbella and Kurvalden. If you are still thinking about your winter ski holidays and haven’t decided yet where to go – pay your attention to Lenzerheide. This place seems to be a real winter paradise, where you can enjoy the sparkling winter days, where the snow-covered forests alternate with frozen lakes and seem to make time stand still. And no matter what you prefer to do - cross-country skiing, hiking against the backdrop of snow-covered nature, quickly descend from the slides on the sledge or just ... do nothing, taking deep breaths of the purest alpine air and relaxing. Before the important point on the way between Kure and Tiefenkastel, Lenzerheide is at an altitude of 1500 m above sea level in a high valley - it is a popular winter and summer resort for families and sports fans. A tourist resort in this place appeared in 1882 when a small hotel "Kurhaus" was opened on the basis of the local cheese factory. The first ski lift was built here in 1942. The modern Lenzerheide is a unique combination of an ancient Alpine settlement with developed sports facilities and spa centres located around a high mountain lake. Idyllic, like a well-kept park, the countryside of the Lenzerheide valley offers excellent opportunities for vacations - lazy or saturated. In winter, the ski area awaits fans of winter sports, stretching on both sides of the valley. As it’s saying: everything has a downside. And Lenzerheide is no exception. Only both sides are sunny. It is a sun-drenched winter paradise located on two sides of the valley - east and west. The time of transfer to Lenzerheide ski resort from these pick-up points is approximate, because, as you probably know, traffic on road and weather conditions can significantly impact these times. Apls2Alps provides the best quality transfer services that are available at any time during the whole season. Even if you will be travelling in the high season, you still can be 100% sure of the most beneficial transfer cost. All our clients already know that Alps2Alps never overstate transfer prices at any time or by any reason. But we always recommend our customers to book the transfer as early as possible in order to get access to the best offers that will let save the most. Travelling in the low season or at working days (from Monday to Friday) typically leads to the biggest savings. Apls2Alps provides huge discounts (up to 60%) for mid-week transfers. Your transfer quote will also be dependent on the availability of the car, the transfer schedule, the use of the vehicle and some other costs like tolls and airport parking charges. If you still have some questions or any additional requirements, please contact us directly so that we can discuss all details of your trip. Lenzerheide has 225 km of well-trained trails for skiers of all levels of training. More than a third of the descents are treated with snow cannons, which guarantees an optimal level of snow even in the absence of snowfalls. 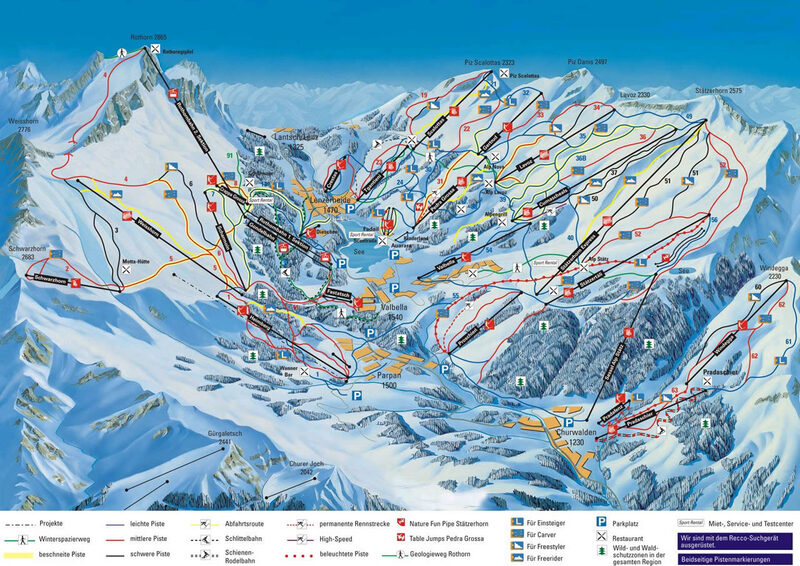 One of 43 lifts will quickly take you to a large number of ski slopes, sunny panoramic terraces and cozy alpine huts. Lenzerheide has a lot of various opportunities for family recreation, including the service of children's nannies, and a large number of hotels suitable for families with children offer options for any wallet. The resort has the sign of quality "Families Welcome" that means there are all the conveniences for spending vacations with children: nurseries, gardens, hotels and family apartments for every taste and purse. In Alps2Alps we are ready to offer our clients the full package of premium quality transfer services. As we are a team of professionals, we certainly know all the expectations of the ski travellers. What they all want from a transfer company? Be on time at the place, travel with comfort and, of course, pay the most beneficial price for that transfer. Right? During the peak season the prices for transfers to all the most popular ski resorts will be much higher. What’s why we recommend you to book your transfer in advance to get the biggest value of money. Just give a call to our customer service managers or fill out the online request form. Let your ski holiday will be an amazing winter adventure that starts here, in Alps2Alps. Just one click – and let’s ride!